Hello, lovelies~ Last week, I said that I will do an updated post on using the sponge with a cleanser, but I don't like it at all. So, I didn't continue to use the sponge with a cleanser and used it solo. This post will be a review on the sponge itself. Disclosure: This sponge is sent to me for review purposes. All of the opinions I have are honest and I'm not paid to say these things. Made from 100% pure vegetable fiber, using the world most famous Jeju in Korea (registered as UNESCO World Heritage Site). Excellent for all skin types even those with hypersensitive skin. The sponge came in a plastic pouch with a clear window in the middle so you can see the inside. There are five types of sponges catered to every skin type, from dry, normal and oily. 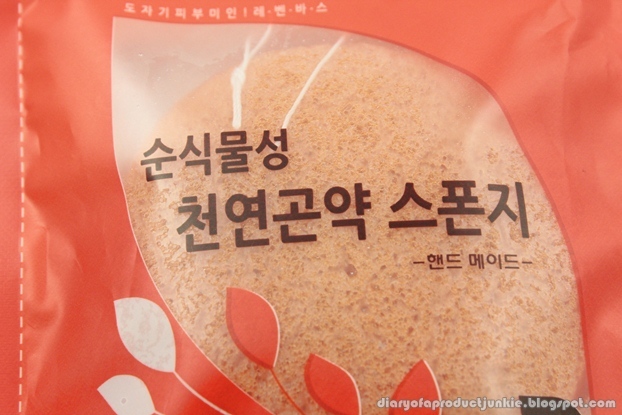 Each sponge has its own color theme, matching the plastic pouch with the sponge. Once I let the sponge out of the plastic, I can feel it being slightly damp. Maybe it's packaged this way so it can be used immediately right away. All I have to do is soak it in water, lightly squeeze the excess water and massage it all over my face. The texture of the sponge is soft and springy, with pores of various sizes all over the surface. 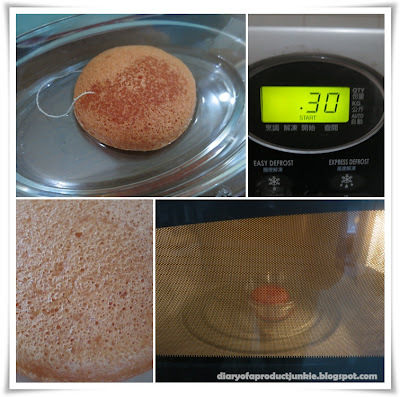 As it is round, the sponge has two sides, which are surprisingly different. One side is a slightly rough texture, perfect for exfoliating and removing dirt and grime. The other side is soft and smooth, beneficial for buffing or polishing the skin to acheive smoother skin. I would place the sponge in a bowl or a glass, depending on what container you have. Fill it with water and let the sponge soak the water for 20-30 seconds as long as it is already wet. Gently squeeze the sponge to remove the excess water and rub it on the face for 30-60 seconds in circular motion. After that, I rinse my face and pat it dry with a towel (and smile for the camera). I have been using this religiously for two whole weeks, day and night, without any cleanser. Surprisingly, it has kept my skin clear, soft, and smooth. However, I do feel the need to disinfect this sponge if I were to use it without any face cleanser. I placed the sponge in a microwave safe dish and "cook" it for 30 seconds. 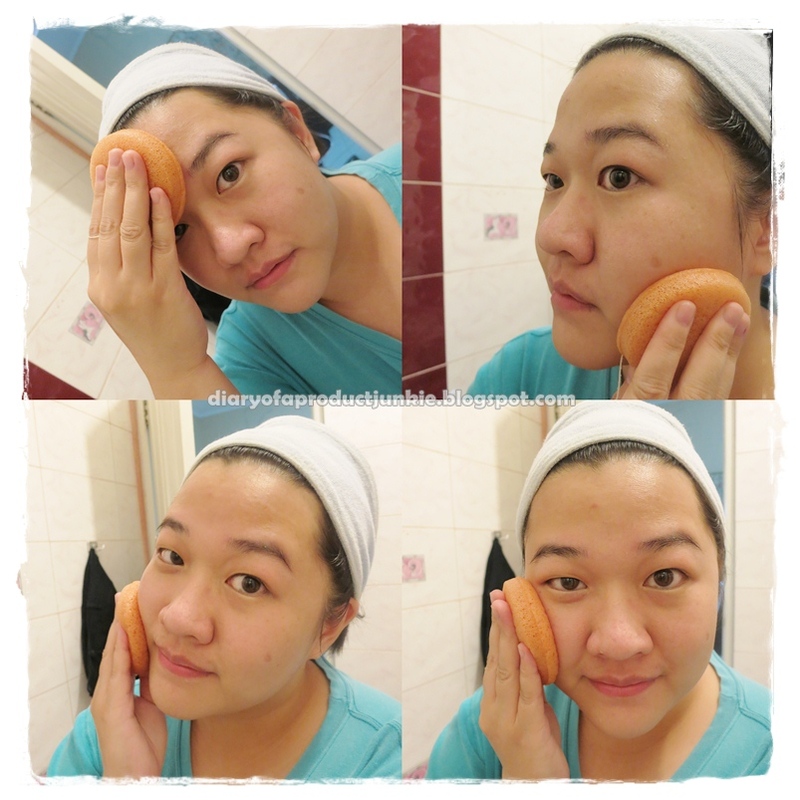 Overall, I really liked this sponge as a face cleanser because of its gentle texture. Also, it's great because it reduces the chance of surfactant getting into direct contact with my skin (which is usually the cause of my breakouts). I would probably repurchase this if mine ever gets badly damaged. aku dah nyoba ini, tp yg pink..
Monica, iya, aq juga akhirnya beli yang pink..
tanya dong say ^^ ini cuma dipakai untuk cleanser biasa gt ya? ngga perlu dikasih cleansing foam? Waah pengen cobaa.. Satu sponge ini masa pakenya kira2 berapa lama ya phanie?